Abu Dhabi, 23rd October 2013 – Rocket Internet, the world’s largest internet incubator and iMENA Holding, the leading online investor and operator in the MENA region, announced a partnership to launch ‘Easy Taxi,’ Rocket’s mobile taxi app, in the Middle East. The partnership will see iMENA investing USD 7M into a new venture that will bring the successful app model to Middle Eastern customers, starting with Saudi Arabia, where the service went live today. This investment represents the largest funding to-date for a mobile application business in the region. With a steady growth and global rollout in Latin America, Africa and Asia, the app model enables investor confidence, for a rewarding future in the business of mobile applications. 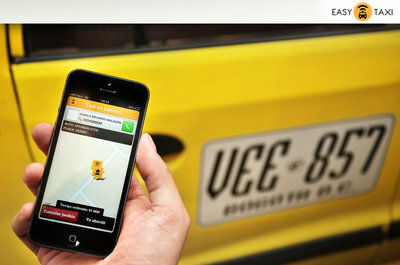 Easy Taxi (www.easytaxi.com) was launched by Rocket Internet in 2011 and is now one of the world’s leading mobile Taxi apps, connecting drivers and passengers in a smooth, easy and safe way. The app, available for iOS, Android and new Blackberry devices, confirms the customer’s pickup point and orders the closest cab in his vicinity, with the press of a button. In seconds, a confirmation of the driver’s name, photo, and car model and plate number are sent to the phone. From here on, customers can follow the vehicle’s location in real-time as it approaches, favorite addresses can be saved and the ride history checked. Since drivers are checked for compliance, before joining the network, passengers can be absolutely content about their safety and can simply enjoy their ride. Currently, Easy Taxi is available in 15 markets including Latin America, Africa and Asia. Globally, Easy Taxi app has more than 2.000.000 downloads and over 60.000 taxi drivers in the network. Earlier this year, Easy Taxi received fresh capital from Rocket Internet, the Latin America Internet Holding (LIH) and the African Internet Holding (AIH). “We are thrilled to collaborate with Rocket Internet once again for the launch of Easy Taxi in the Middle East. The company’s scale and achievements after only two years of operations are highly impressive. Given the management’s track record, the trend of mobile apps, and the market’s macro outlook, we are very confident in the regional success of Easy Taxi. With our strong global partners AIH, LIH and Rocket Internet, as well as our regional partners, including Etisalat Group and their operating companies across the region, we believe, we can redefine the online business in the Middle East and set the path for a successful and profitable future”, said Khaldoon Tabaza, iMENA’s co-founder and Managing Director. MENA Holdings is the leading group of online consumer businesses in the Middle East and North Africa (MENA) region. The company invests in, builds and partners with leading teams and organizations to form an integrated and actively managed group of online platforms in the Middle East and North African (MENA) region. In addition to its investment activities, iMENA Holdings offers its partners a wide range of strategic and operational support, which includes the provision of professional services, representation and distribution agreements, partnerships, joint ventures and licensing of technologies or products for the MENA region. With the strategic support of Etisalat Group, a leading telecommunication holding in emerging markets and investment capital from the region and around the globe, iMENA's strategy is to own and operate companies with proven business models, executed through the establishment of new businesses, partnering with established leaders and investing in existing companies.